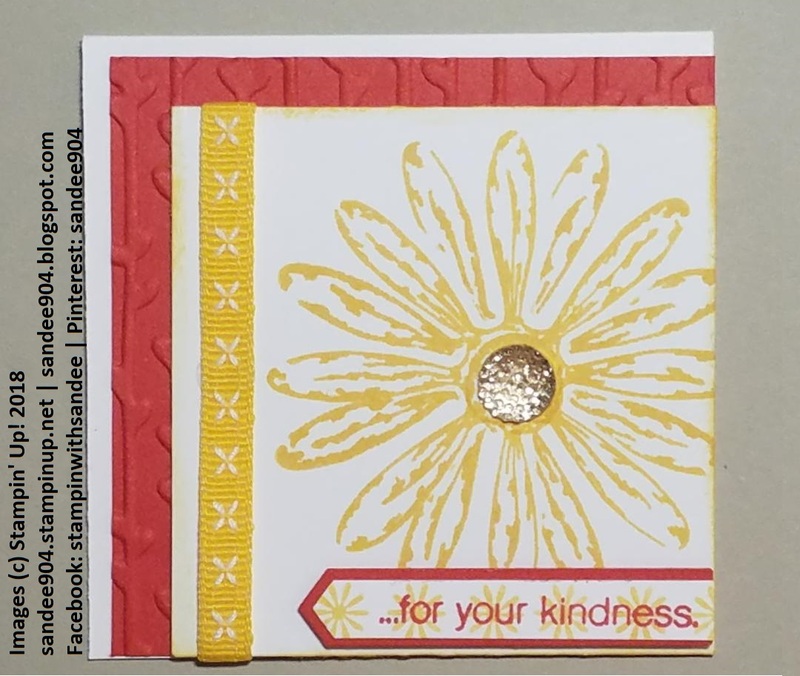 Today's 3x3 card is made using the Daisy Delight stamp set. Just a quick post to keep everyone stamping. When last year's catalog was released, one of the first stamp sets that I just had to have was the Daisy Delight bundle. I still love this bundle today. Seriously, I think this post will make the third post in 2 months using this stamp set. Yes - I do like this stamp set! Here is the 3x3 thank you card I made last year to thank my customer's for purchases. I thought it might be fun to remake this card in Poppy Parade and Daffodil Delight. This time I tried stamping the daisy twice (stamp first, mask, turn the block a bit and then stamp a second time). I love that the 1/4" double-stitched ribbon and the Petal Pair TIEF carried over. Nice assist, right. June Hostess Code is PDFYJURZ. Please use this code unless your order already qualifies for Stampin' Rewards ($150 USD). Message me if you have questions. 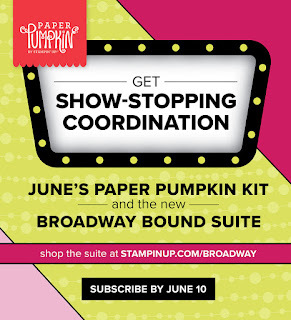 Looking forward to seeing your creations using the June Paper Pumpkin kit and the coordinating Broadway Bound suite found on p. 68-69 of the 2018-2019 annual catalog! In October 2018, Stampin’ Up! will turn 30! The convention will be held at the Orange County Convention Center in Orlando this November. Do you know how you can go? Join my team so that you are eligible to attend. Message me for more details. Good day my crafty friends. Welcome to the June Blog Hop! 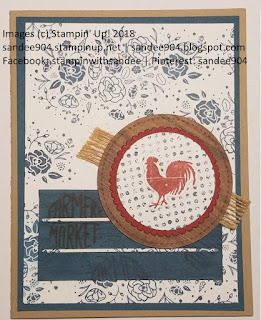 I am participating again in a blog hop with fellow Stampin' Up! demonstrators from all over the United States, United Kingdom and Canada! You might be starting the blog hop right now, or you may be coming from Elizabeth Green's blog - Happy Canada Day!! Welcome one and all. 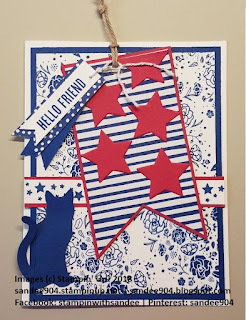 The theme for our blog hop this month is anything patriotic. Here in the States, the next patriotic celebration is America's birthday on July 4th a/k/a the Fourth of July. Celebrations include parades, picnics with lots of good food and music and the day concludes with spectacular fireworks in the sky once it is dark. Nothing wrong with thanking those that make this day special with a thank you for your service card!! 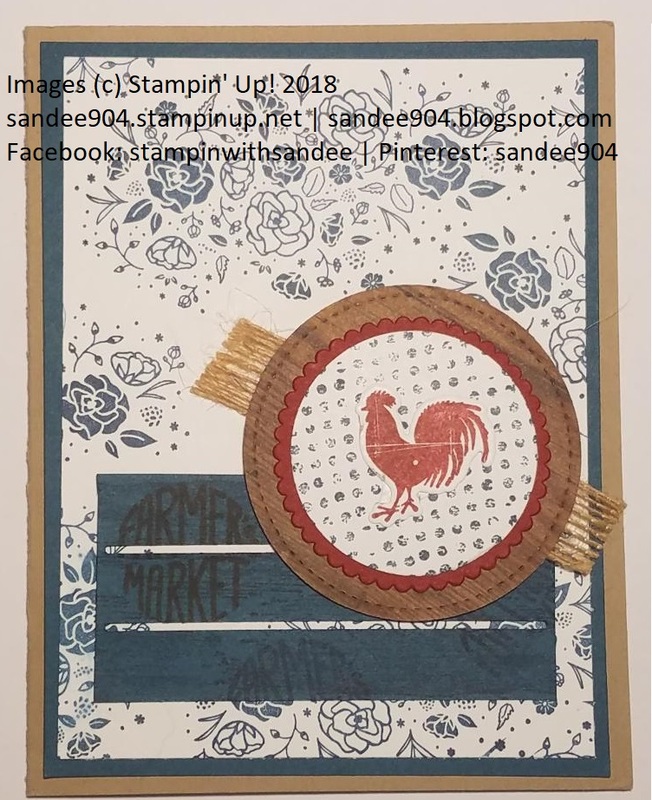 This tag card uses the Wood Words stamp set and two of the new 2018-20 in colors, Blueberry Bushel and Lovely Lipstick. These colors really look great together. Notice I was able to sneak in a cat in the bottom left corner. So happy the Cat Punch is still available! On the inside of the card I stamped the thank you sentiment on three stamped hearts (love the country heart stamp) and the image on top is the scrap of the tag/flag layer with an extra star. I sure hope you have enjoyed my card and I hope your celebrations are fantastic. Leave a comment below with a trail to find you so I can see your creations. Thank you for stopping by my blog today! Make sure you keep hopping along to see all the other great cards and projects. Click on the "Next" button below to visit Sue Kremer's blog. Good day my crafty friends. 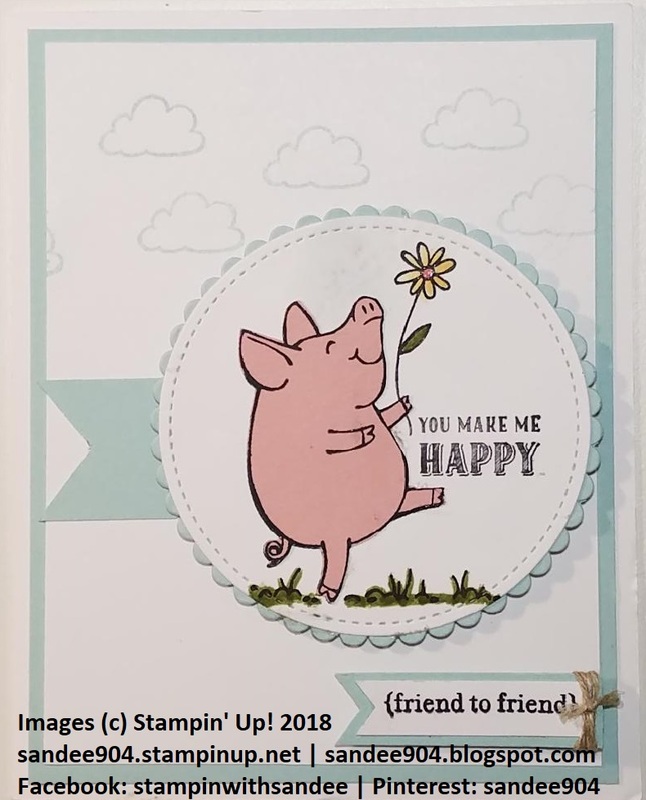 Today's card is from a previous class last year.that features this adorable pig from This Little Piggy stamp set. Not sure if you can tell from the photo, but I decided to stamp the pig on Blushing Bride cardstock with Stazon black ink and fussy cut. 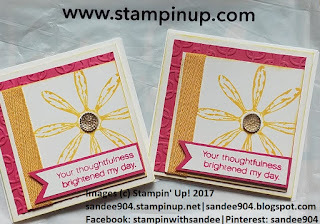 At the time, I do not think I had the new Stampin' Blends or maybe I would have given it a try here. I stamped the pig with flower image again on Whisper White cardstock and adhered my fussy cut pig right over the top. Worked like a charm! Before adding the sentiment and grass, I used the largest circle from the Stitched Shapes dies so that I had proper placement. Then largest scallop circle die from the Layering Circles is Pool Party. The second sentiment is from the retired Teeny Tiny Wishes stamp set, but I am sure we can find a sentiment from the new Itty Bitty Greetings stamp set. And this sentiment is finished off with a couple of wraps of linen thread tied in a knot. 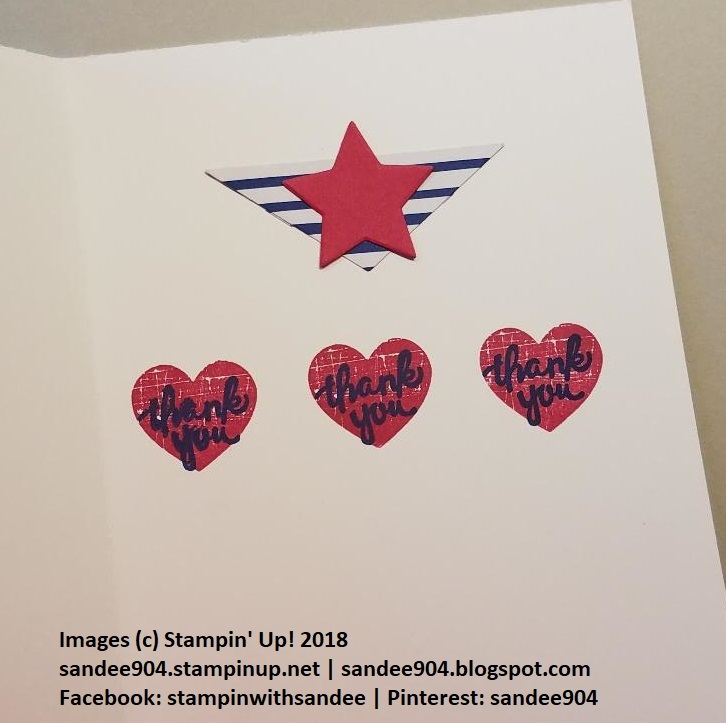 Thank you for stopping in to catch up on my cardmaking today! Leave a comment below with a trail to find you so I can see your creations. Happy to report coordination between Stampin' Up! and Paper Pumpkin. 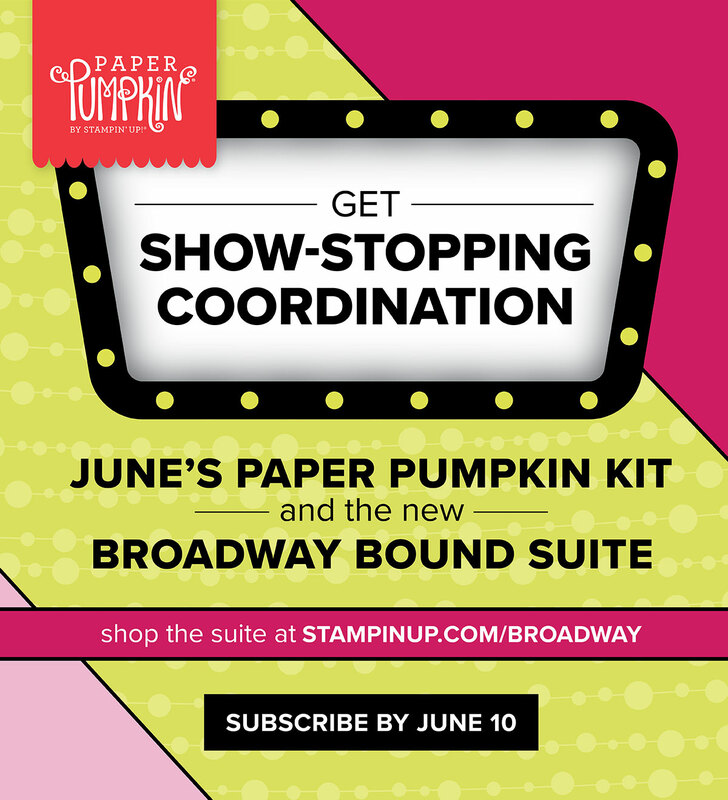 Starting with the June Paper Pumpkin, the kits will coordinate with the Broadway Bound suite on p. 68-69 of the 2018-2019 annual catalog. This will spark your creativity! Have you tried the new Stamparatus yet? 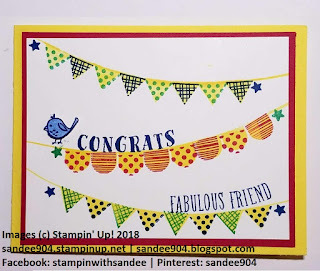 I would be delighted to demonstrate the use of this fantastic stamp positioning tool at a workshop for you and your friends. It is simply awesome. Well, life gets in the way of things and sometimes plans have to be shuffled. That was this week! I have been posting weekly on Wednesdays, but this weekend was my birthday celebrations so that left no "me" time to prepare for this weeks blog. Let's just move on. 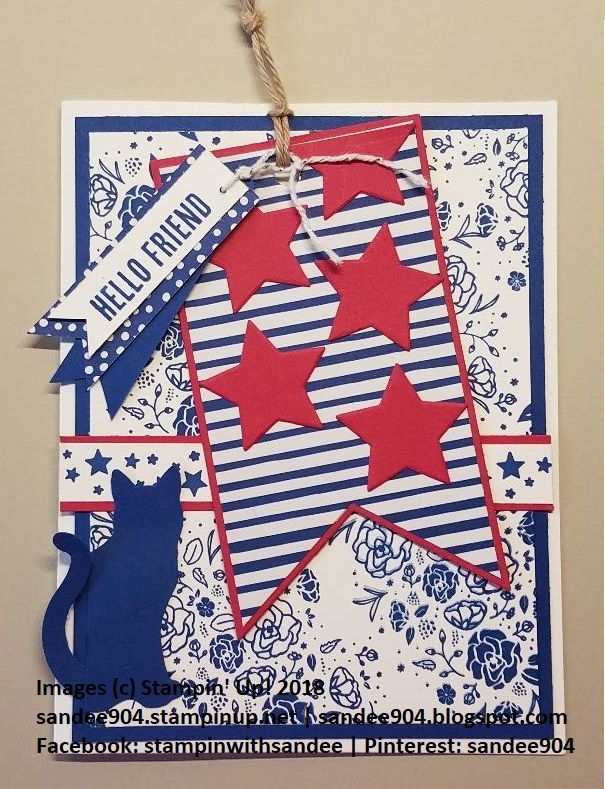 This is a quick card that we made last year using Wood Words stamp set, which has carried over to the 2018-19 annual catalog. 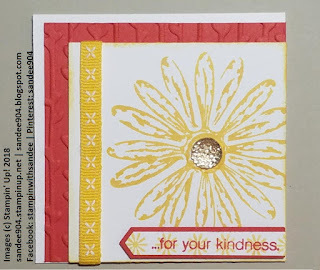 I am planning to remake this card for the June Monthly Blog Hop so check back on the June the 20th for the reveal. This is truly a quick and easy card so no instructions today, but if you are stumped by anything, message me and I will get right back to you. PS: DO NOT FORGET to subscribe to the June Paper Pumpkin kit. This kit will coordinate with the Broadway Bound suite on p. 68–69 of the 2018–2019 annual catalog. We will get together make some fantastic cards later this month.